Impeccable lug sculpting, tidy dynamo wiring, infinitely deep finishes, and minute detail work are all of utmost importance when evaluating and admiring the work of a custom bicycle builder. I think appreciation and articulation of detailing and design is an important skill to have when going around to different builders at shows like these. 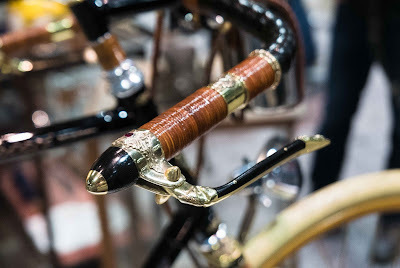 Rather than show a busy, poorly lit photo of a complete bike on the showroom floor, I'd like to focus on the detailwork of several of my favorite bikes at NAHBS 2018. 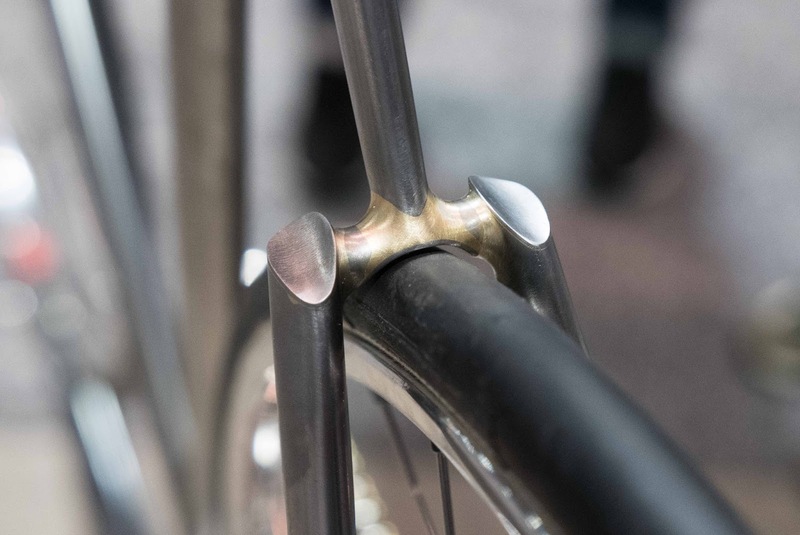 The brass on this track bike's rear end seems to simply wash over the seat stay bridge and wishbone, gently holding everything together in a fervor for speed only a Bishop can pull off. 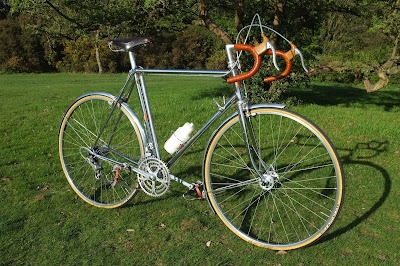 The seat cluster on this Randonneur bike is sublime. There is so much going on in a little space: polished stainless wrap around stay caps, bi-laminate sleeve with a super narrow point, and a pair of seat binders. From Brian's Instagram about the double binder, "It’s not necessary but the single M6 would’ve looked lonely on there". Brass, ebony wood, leather, shellac, and lacquer all come together to accomplish this artisanal cockpit on this bike steeped in old-world design and ornamentation. 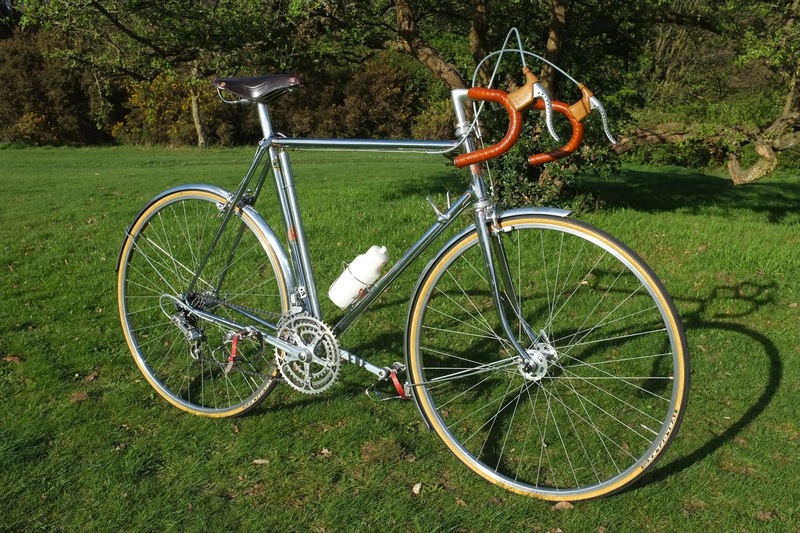 The seat cluster on this track bike has an air of 1930's art-deco. Squares and long curves accentuate the clean, custom lug and fillet brazed, lowered binder. Lovely. While the alternate digital camo graphics on the outside of the fork blade are attention grabbing, the inside of the blade features this Russian builders logo - the font color matching the contrasting blue-grey within the pattern. 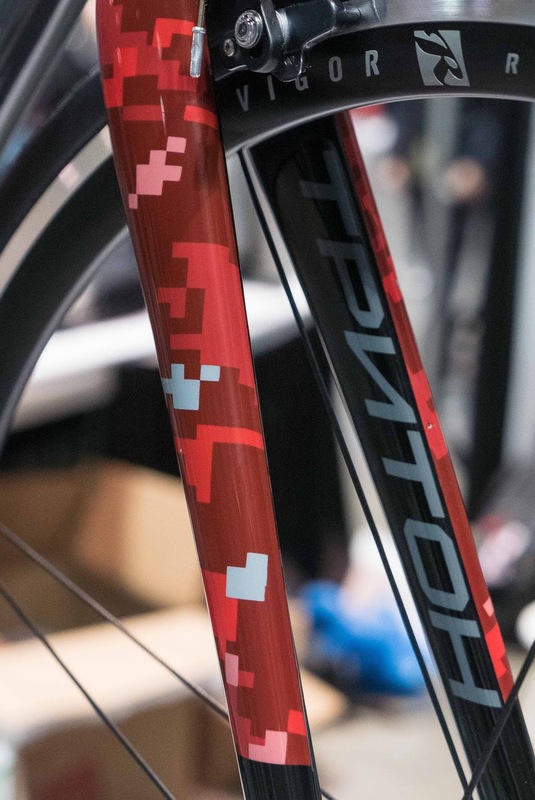 While I don't know much about this air-foil's application on bike frames, I do like the swoops and lack of hard lines on this three-play laminated wood and carbon composite bike. 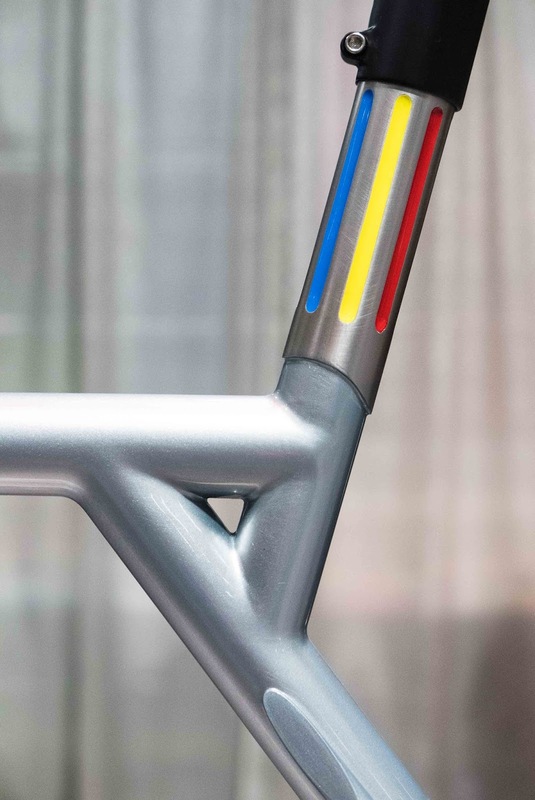 This wild track bike features a fluted and paint-filled seat mast which terminates into the monostay. Radical. 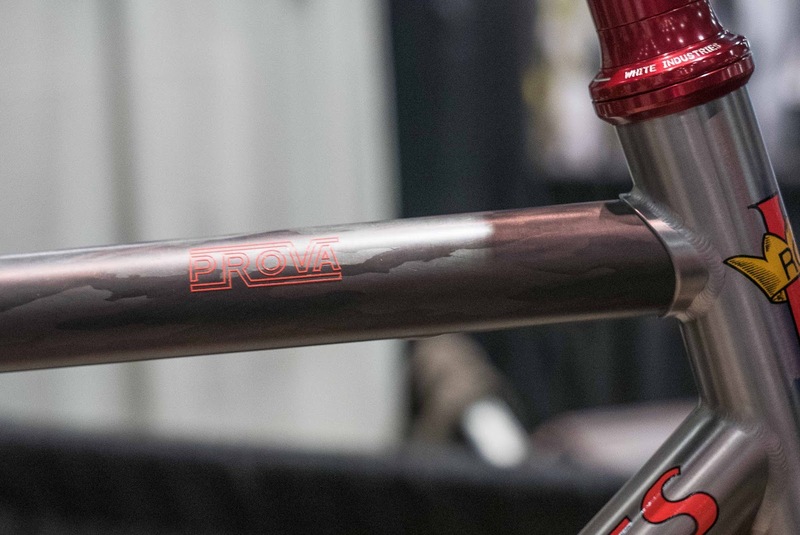 This marriage of carbon and titanium in a traditional lugged form is incredibly clean. I'd love to know the ride characteristics this combination provides. 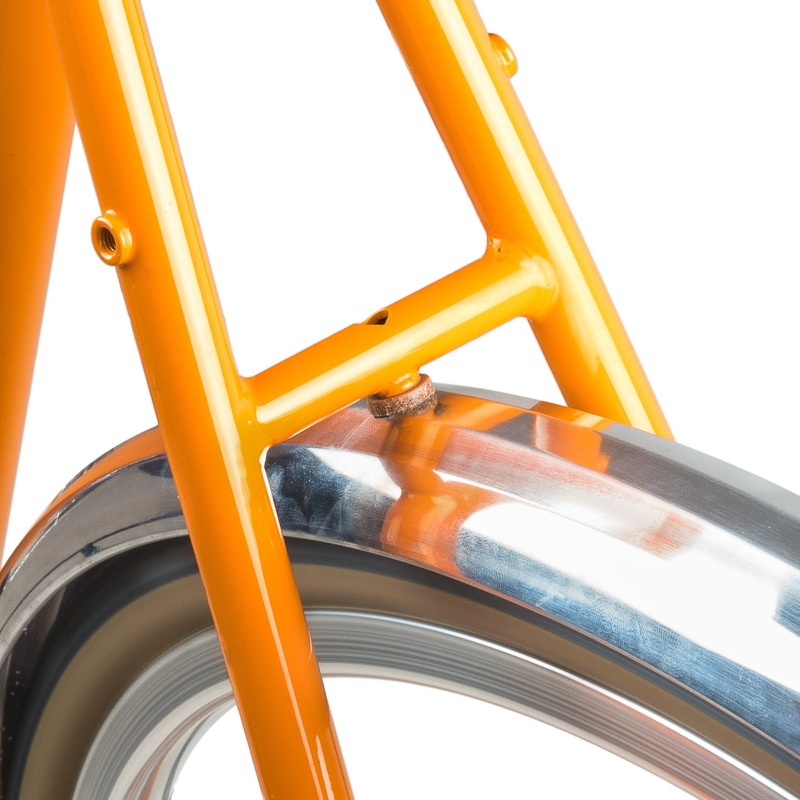 The inward bending on the fender stay makes the rear end more racy, an important feature for this get-up-n-go fender'd road bike. Additionally, notice the impeccable lining on the Hammered fender's edge. Nice contrast! 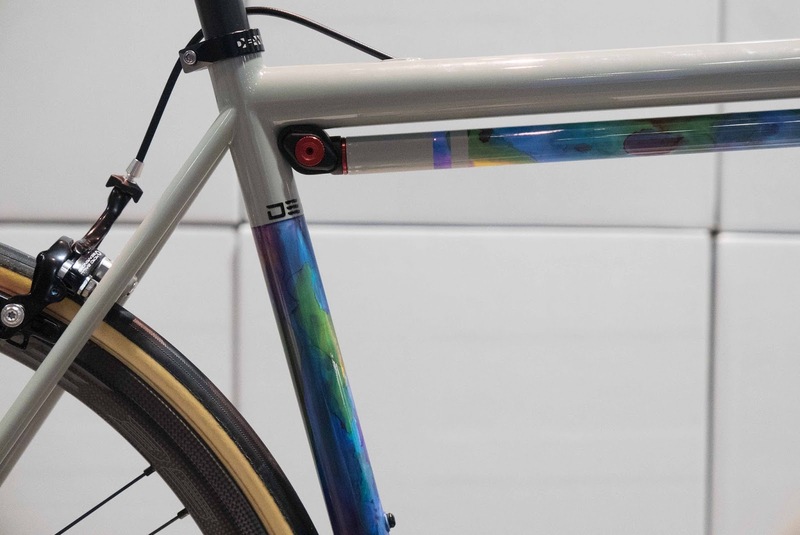 The watercolor panels on the seat tube and pump were an elegant choice on this road bike. Zipties be damned! Sometimes the the best way to secure something is by a simple wire. 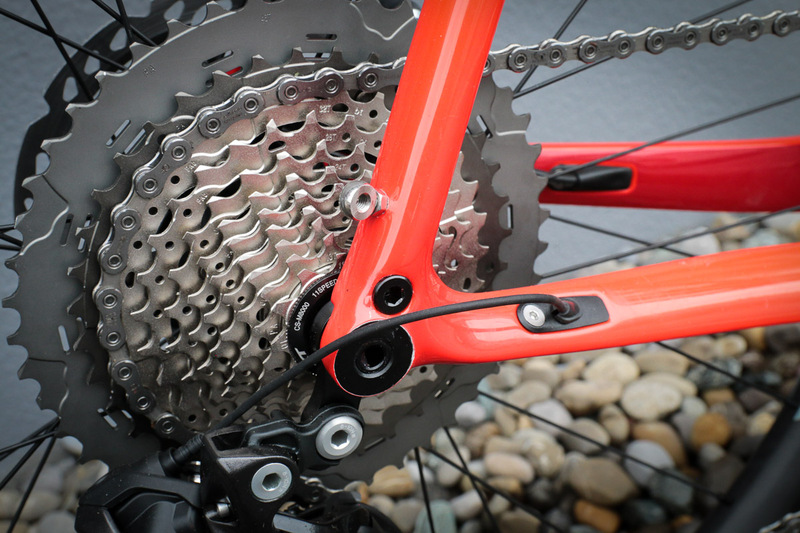 With the trickle down of disc brakes into bikes of any and all sorts, our inbox has been deluged with questions about fender mounting and compatibility. 1) Clearances - Your frame should have reasonable clearances around the chain stays and seat stays, and your fork should have sufficient vertical and lateral clearance. 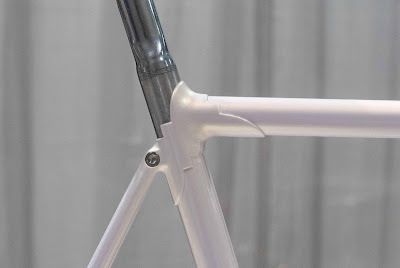 Road racing and track frames, more often than not, have very narrow clearances around chain and seat stays and fork crowns. 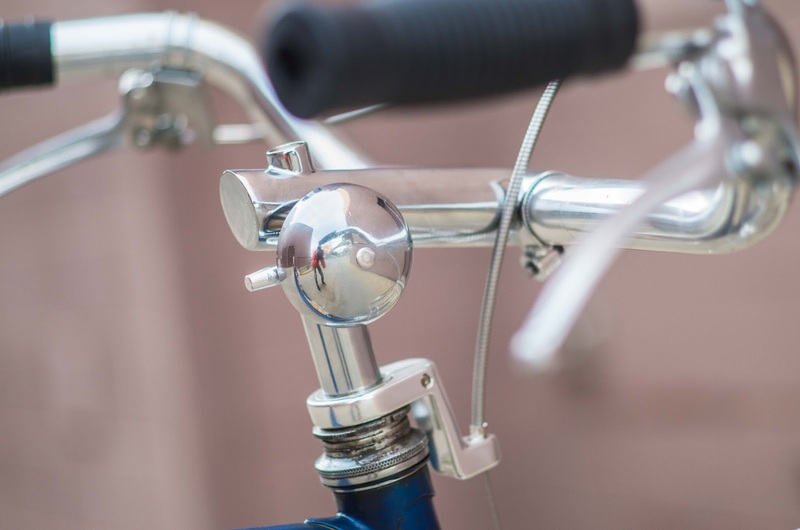 These bikes are designed for aerodynamics and drastically reduced weight. This often means that if a detail isn't designed for structure and performance, chances are you won't see them. 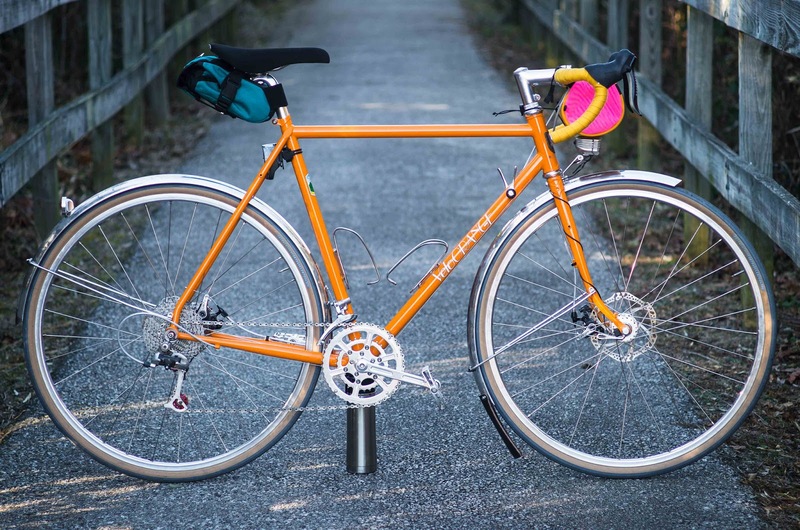 Forget about dedicated rack and fender mounts or even triple bottle cage mounts. Grams add up to lost time over a stage. 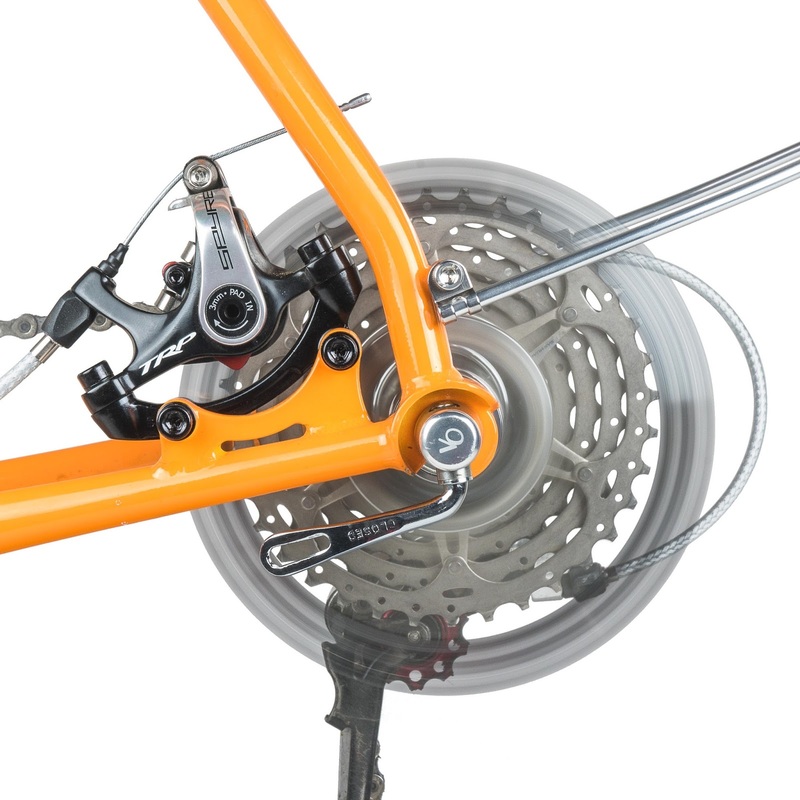 Vintage frames that use centerpulls or longer reach brakes typically have more clearance, especially if you do a 27 -> 700c wheel conversion. 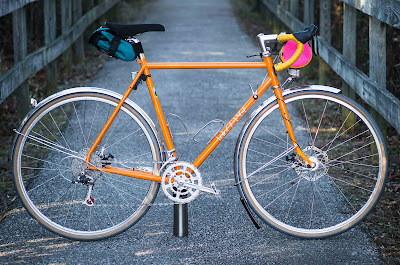 These often make great randonneurs and sportif bikes as they feature a multitude of desirable attributes that are incorporated into many of today's modern offerings including lightweight tubing, low bottom brackets, and bigger tire clearance. Some even make for good 650b conversions for even floaty-er tires and clearance. Pro tip: Before a long climb, move your water bottle from your cage to your jersey pocket. 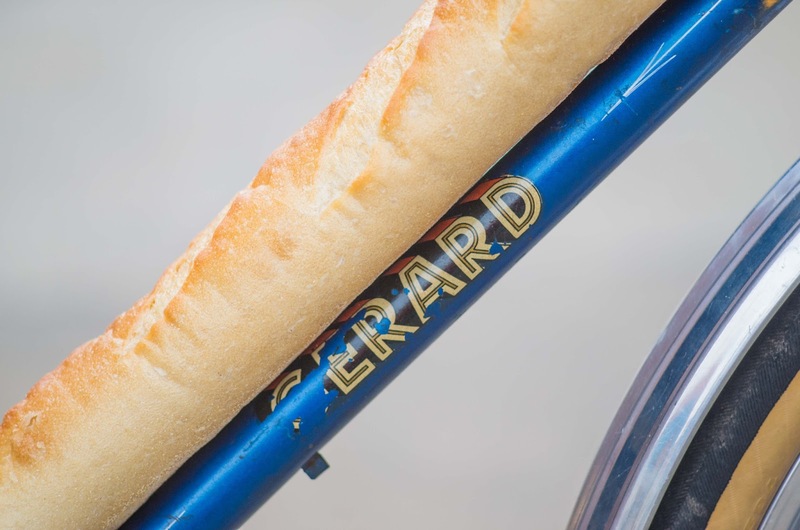 You'll climb faster due to less weight on the bike. Discuss in comments. 2) Bridges - In order to have an easy time of mounting, both your seat stay and chain stay bridges need to exist - bonus points if they have threaded braze-ons that point towards the wheel. 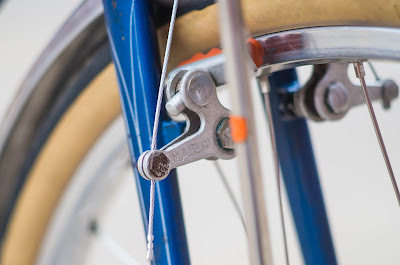 If your bike does have a bridge but it isn't drilled, use a p-clamp! We've noticed a lot of contemporary cyclo-cross bikes are bridge-less for mud clearance and comfort over rough terrain. While it is possible to mount a fender using a kludge of hardware, it isn't ideal and it certainly isn't elegant. 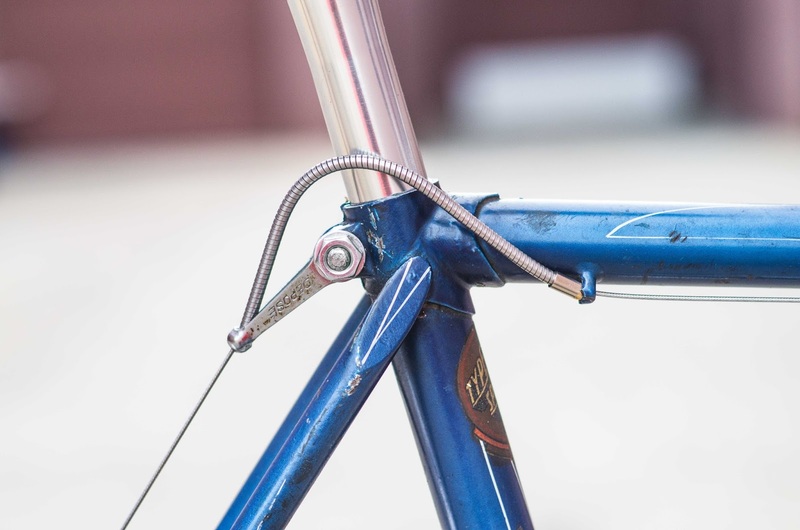 3) Dropout Eyelets - Threaded or unthreaded, these are incredibly useful. 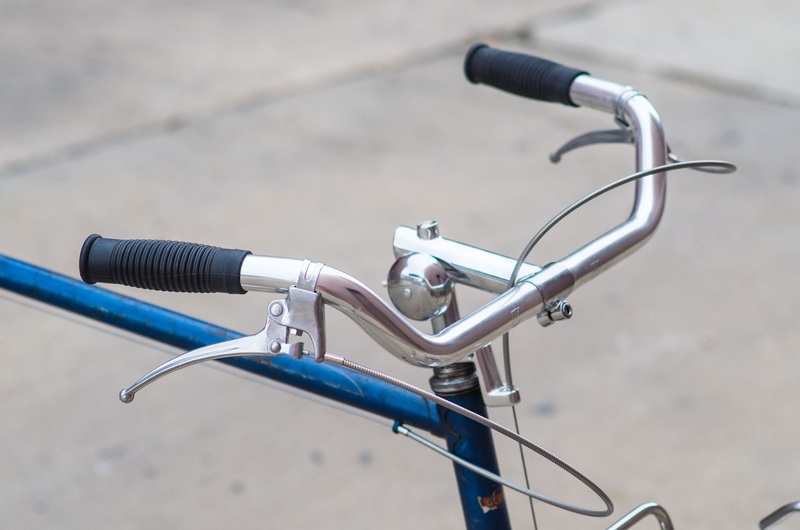 If your bike has the above requisite features but doesn't have eyelets on the dropouts, p-clamps or our Fender Stay Mounts for Eyeletless Frames are needed to mount the stays to the frame or fork. Alas, many manufacturers have forgone eyelets on their performance offerings, though some lucky few offer removable ones. I never understood this. If you're going to drill and tap the frame for a stud for a removable eyelet, why not include it in the casting/mold? It would look intentional and simple. That's it for the requirements! The next step is negotiating the caliper. For the frame, there is typically minimal finagling. 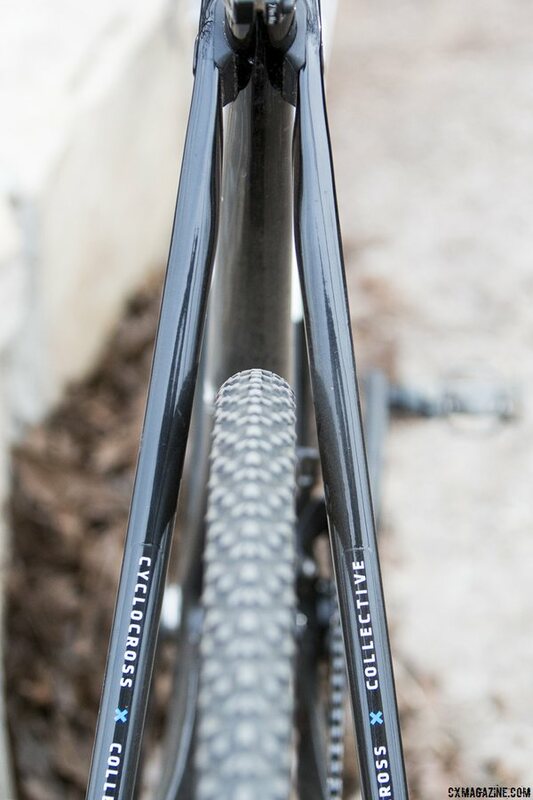 This is especially true if the caliper is located within the rear triangle like our frames feature. 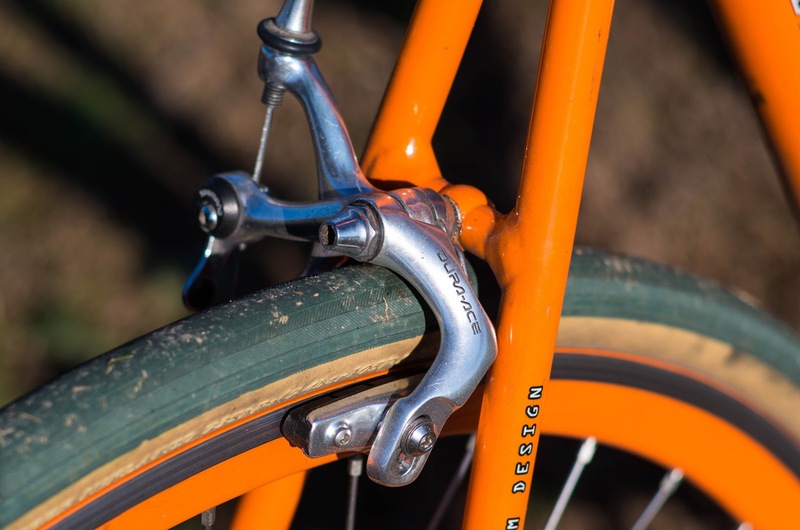 For caliper located on top of the seatstay, you'll have to play it by ear since the size, shape, and location of the caliper may necessitate bending the stay. The front is a bit trickier. The caliper, for the most part, sits in the same place for almost all forks. 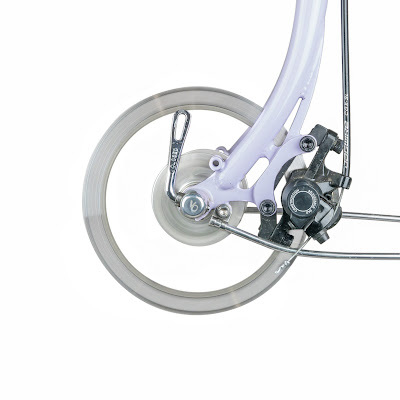 Simply bending the stay vertically around the caliper should provide enough clearance for the brake to operate normally. Some forks, like our Pass Hunter, simply offer a higher mounting point to get around the issue. It isn't the most traditional looking, but it functions perfectly fine. 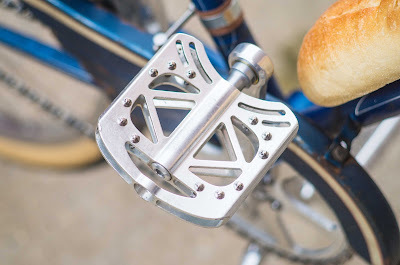 The Polyvalent has a braze-on underneath the dropout for regular fender mounting. If this isn't possible, you'll need a fat stack of spacers to clear the caliper. 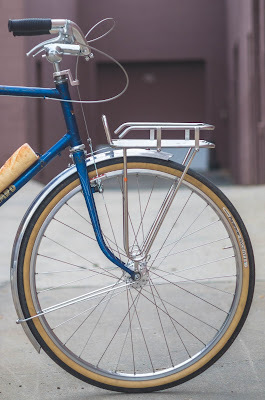 Plastic fenders that use two stays typically require this. Do you have any additional tips or tricks for mounting fenders on disc brake bikes? 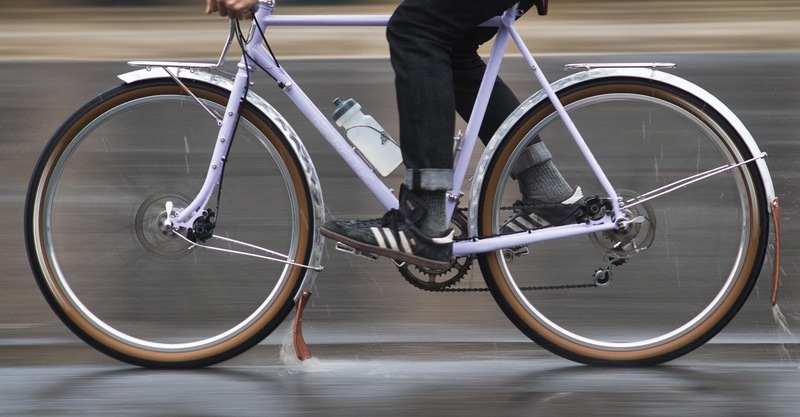 The combination of full coverage fenders and mud flaps serve two very important purposes: 1) keeping your feet and bottom bracket clean and 2) ensuring your riding friends will ride with you again by preventing road grime from spraying up into their faces. Ideally, the front mud flap should be very low to cover the most spray area, almost dragging. I like curling the front flap so that curbs don't catch the fender when hopping off. The rear flap should be sufficiently long as well. VO now offers matching Rear Mud Flaps in the same colors as the front: Black, Espresso, and Honey. They're 24.5cm long and have a very similar silhouette as the front, just longer. 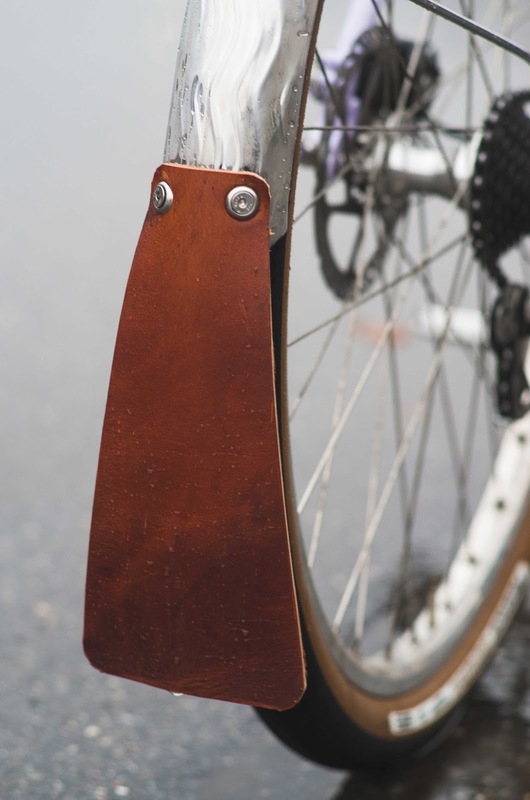 They weigh 105g and include all the hardware needed to mount to your fender. All you need to do is drill two holes. A side note: We work really hard to minimize waste from the hides we use, and that means we get a few "imperfect" flaps. These cuts are just as good and functional as the "perfect" ones but have more character - I prefer these. They usually have cuts, thinner sections, etc - these are cow hides, remember. 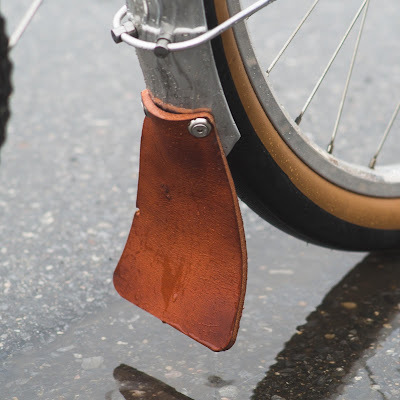 If you want a flap has has imperfections and is wabi-sabi, let us know in the comment section of your order. Gerard (Gerry as we've been calling him at HQ) has turned out to be one spry 61 year old. He has scrapes, bumps, and "that wasn't there yesterday"'s that not only show his age, but describe a life of use and care. Whoever used this bike before me, really enjoyed it. While working on this bike, I was frequently reminded of the old Japanese pottery repair technique, Kintsugi. Kintsugi is a philosophy that lets imperfections and breakages literally shine rather than attempt to disguise them. Gold or platinum dust is included in the lacquer used for repair work, creating beautiful, gleaming veins that allow the piece's history to be at the forefront of one's attention. Interestingly, this technique got so popular, collectors started smashing brand new pottery in order to replicate the style. Gerard was rebuilt with simplicity in mind. 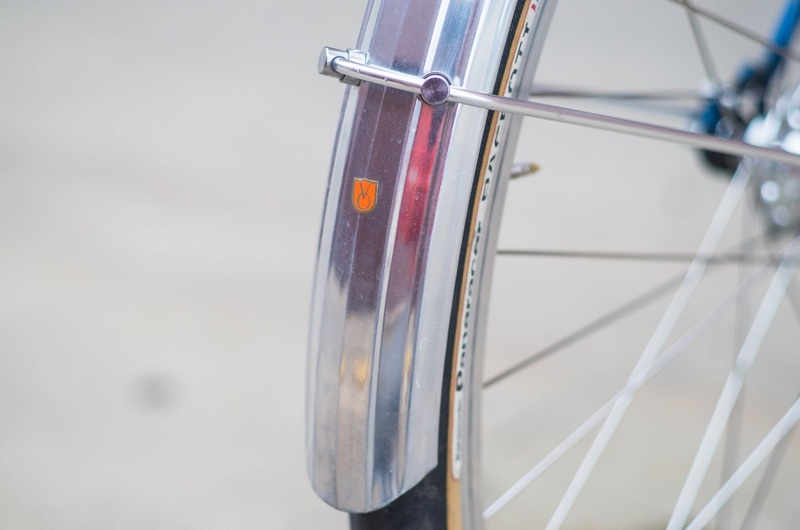 The wheels are sturdy and built to last. The rear is a 32 hole Fixed Hub laced to a 650b Diagonale Rim while the front is a Grand Cru High Flange Front Hub laced to the same. The rear is spaced 120mm so the rear wheel's hub fits without any issues, while the front is 96mm (typical of old French bikes). No biggie, the front hub gets crammed in. 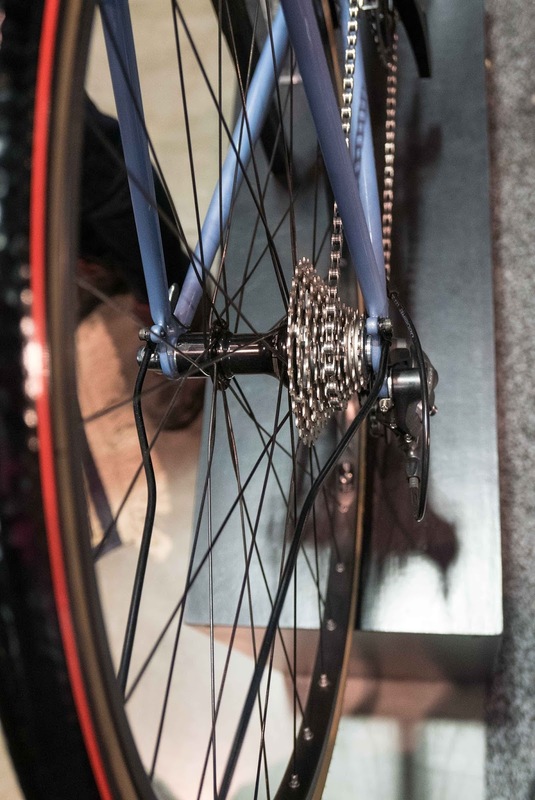 Gearing is midrange: 44 tooth 50.4 chaining paired to an 18 tooth rear cog. This setup makes around town jaunts with a load easy while minimizing spinning out on slightly longer rides. Tires are cushy Panaracer Pari-Motos in the 42mm sizeway. 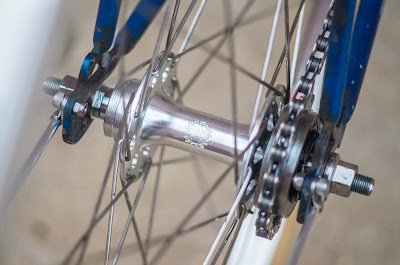 The bottom bracket shell is French threaded (drive side and non-drive side both tighten clockwise) so I used our French Threaded Bottom Bracket with a 118mm spindle. 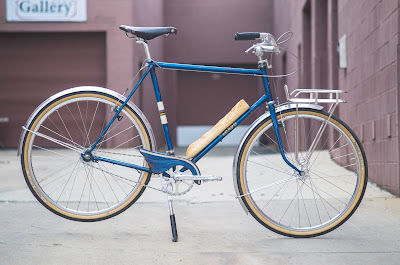 A proper French bike cannot be left without fenders. 52mm Zeppelins wrap perfectly and provide optimal coverage. A clever, little Spring Thing keeps a nice fenderline with the frame's long, horizontal dropouts. 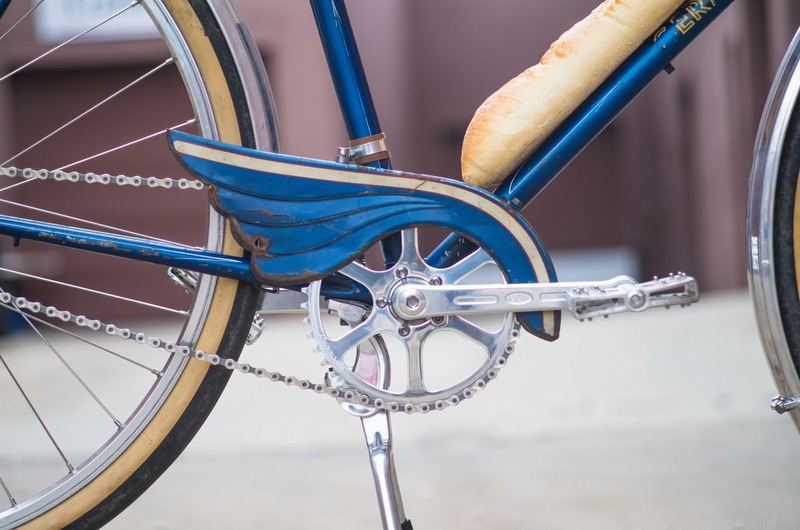 The Porteur Rack is fitted close to the fender by trimming the lower tangs. 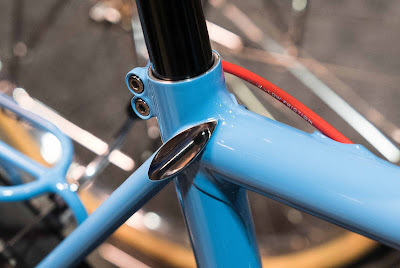 The rack is further mounted to the fender in Constructeur fashion. The Sabot Pedals are my go-to. They're chunky, spinny, grippy, elegant, and look right on this traditional build. Handlebars are the 23.8mm Left Banks with NOS CLB city levers (what the Tektro FL750 levers are modeled after). Grips are the ever comfy and classic Rustines Constructeur in black. Brake cabling is our Stainless Steel Wound kit along with some Step-Down Housing Caps for the brake levers and frame cable stops. The Grand Cru Quill Stem needed a tad bit of sanding to fit into the steerer. Clint did a nice write-up about fitting 22.2mm stems into 22.0mm French steerers. A few minutes worth of sanding allowed the quill to fit in and stay secure. A silver Brass Temple Bell adorns the stem in traditional constructeur fashion. 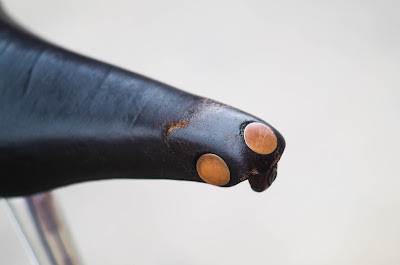 Atop the 25.4mm Dajia 1b Seatpost is an old Brooks perch. I got the saddle when we picked up our Santana Arriva Tandem. I believe it's from the mid-80s. I think it might be too far gone to be remolded, but it sure looks cool! The brakes were disassembled, cleaned and new Kool Stop 4-dot Pads were fitted. How do they stop? They stop, more or less. Mostly less. They modulate speed, that's where I'll leave it. The showstopper here is this vintage, gorgeous chainguard. We've had in it in our showroom's display case for years, waiting for just the right build. The original paint and patina is perfect for Gerard. 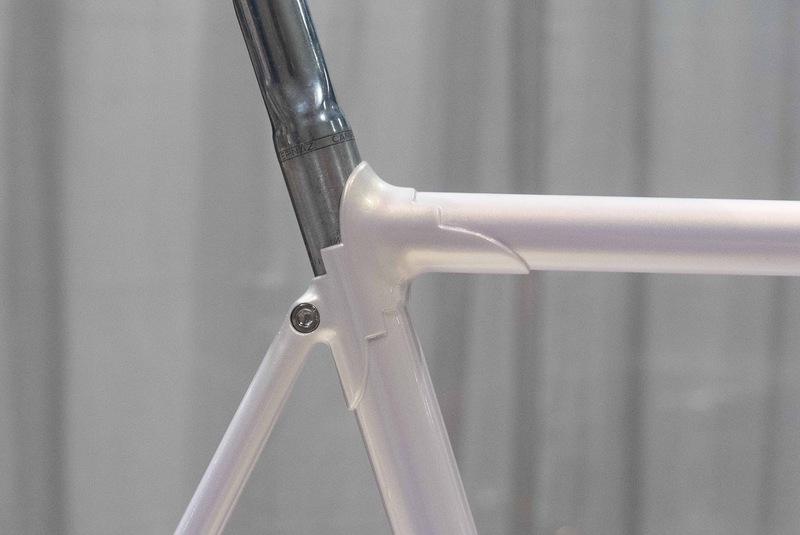 The frame has a single mount on the downtube. 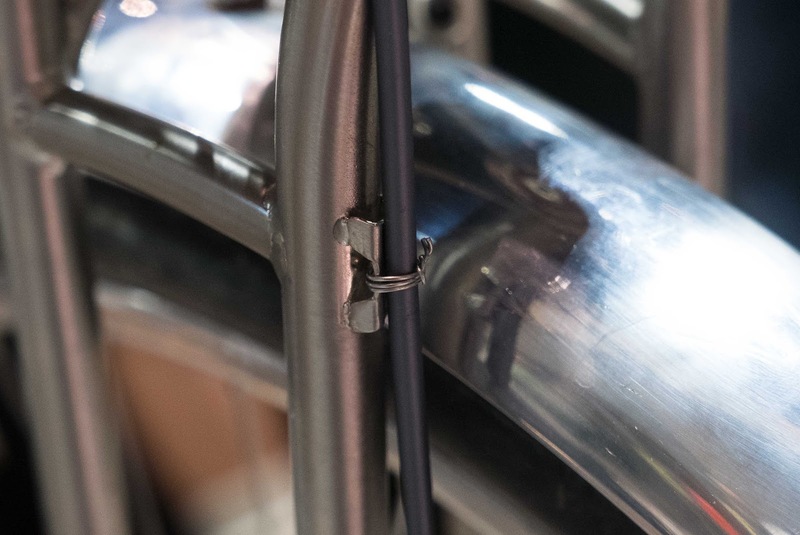 For the seat tube, I used our Chainguard Mounting Hardware and a bit of cloth tape to protect the tube. A Porteur Double Leg Kickstand keeps the bike upright and ready for loading. Experiencing the history, care, and continued service of something so connected as a bicycle and its rider is a wonderful thing to behold: scuffed crankarms from miles and miles of tours, lived in bar tape, saddle with corner tears from taking a gravel laden corner too fast, scratched top tube from that darn sharp sign post I always forget about, and random paint chips from heck knows where. Having a beautifully new paint job is nice, but I don't think babying is the way to go. Embrace the scratches, scuffs, and imperfections, and enjoy your ride.